Gov. 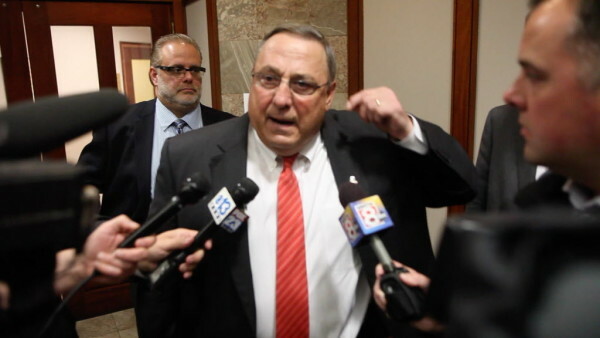 Paul LePage speaks to reporters outside a press conference in Portland in this June 2015 file photo. AUGUSTA, Maine — The career law enforcement official nominated by Gov. Paul LePage to serve as Kennebec County sheriff said he didn’t know he’d be appointed until the governor called his office on Thursday. It’s a bold move by the Republican governor — who is locked in a battle with the county Democratic committee — but his nomination of Chief Deputy Ken Mason of the Lincoln County Sheriff’s Office must be certified by Secretary of State Matthew Dunlap and it raises legal questions. Under Maine law, the county party committee of the departing sheriff is required to submit recommendations for an appointment to the governor, who must “choose from any recommendations” submitted by the committee. County Democrats have only advanced the name of interim Sheriff Ryan Reardon after his predecessor, Democrat Randall Liberty, took the warden’s job at the Maine State Prison in September. Mason submitted his name to the committee for consideration, but he was rebuffed. LePage has criticized the committee for putting forward just one name — including in a Thursday news release where he blasted its “silly games” — and Attorney General Janet Mills, a Democrat, issued a letter saying while the law is unclear, it implies that more than one name should be submitted. But the nomination of Mason, a 30-year police veteran who lives in Readfield, faces other hurdles: The law doesn’t say LePage can nominate whoever he wants and Kristen Muszynski, a spokeswoman for Dunlap, said he has “questions about the lawfulness” of the appointment, although he hasn’t decided whether he’ll certify it or not. In a Thursday interview, Mason said he didn’t know that LePage would nominate him until the governor called his office on Thursday. However, Mason said he’s ready to serve in the job. Only Reardon has filed with the state to run in the November election, though Mason — who is also a Democrat — said he plans to run. The person successfully nominated by LePage would serve as interim sheriff until January, and Mason said there’s no timeframe for him assuming the Kennebec County job. Rita Moran, who chairs the Kennebec Democratic Committee, said she’d leave how to respond to LePage’s Thursday decision to county commissioners. That board is short one member in another county committee dispute with LePage after the September death of Commissioner Beverly Daggett. The committee put forward two nominees for that seat, but LePage has said he wants three, according to the Kennebec Journal. “I look forward to the election in November where the citizens of Kennebec County will decide for themselves,” he said.